This post is by Joel Pelovitz, an intern working on the Innoskate and Places of Invention projects. Joel is a recent graduate from Muhlenberg College with a degree in history and business. 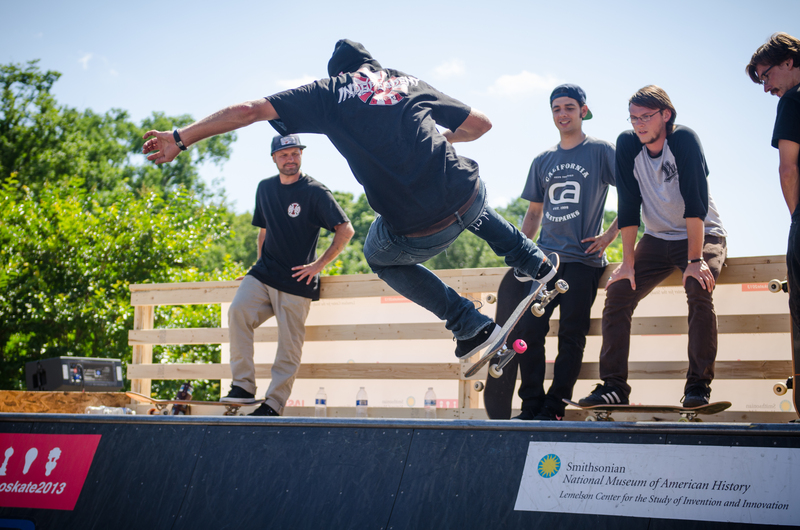 As a returning intern this summer, I had the pleasure of aiding in the preparation and materialization of the Museum’s first ever Innoskate event, which occurred Friday, June 21, and Saturday, June 22. By gathering together some of the world’s most pivotal and influential skateboarding icons—both riders and industry gurus—the Center hoped to gain valuable insight into key innovative strides in technology, skating technique, and cultural impact/adaptations since the sport’s inception. What resulted was a captivating and thought-provoking experience that drew crowds of all generations and backgrounds. 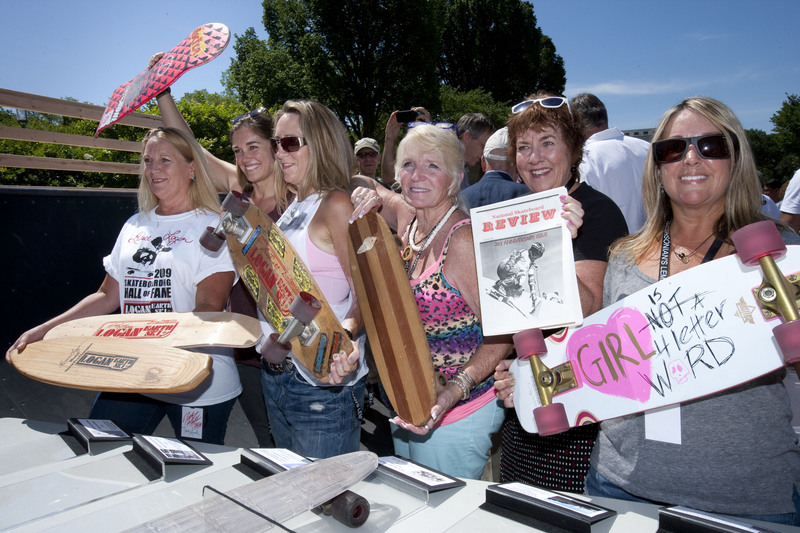 The participants—a group consisting of skaters, including famed skaters Tony Hawk and Rodney Mullen; designers; media personalities; and engineers—donated their skateboarding history to the National Museum of American History’s collections, held discussion panels on invention, and gave skateboarding demonstrations on a ramp built specifically for the event! Donors to the national collections included Robin Logan, Mimi Knoop, Laura Thornhill Caswell, Patti McGee, Di Dootson Rose, and Cindy Whitehead. Smithsonian photo by Hugh Talman. 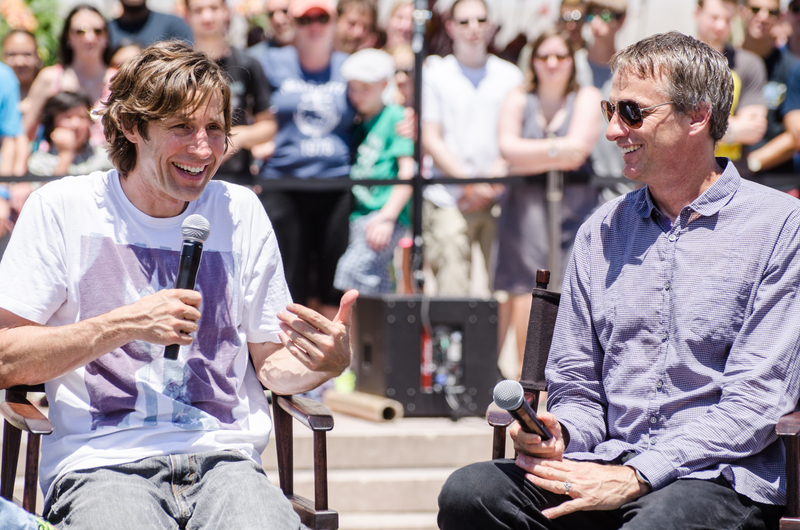 Rodney Mullen and Tony Hawk talk about their inventive process during one of our panels. Photo by Tyrone Clemons. Chris Haslam was one of the many pro skateboarders who showed off their skills on the ramp we constructed outside of the Museum. Photo by Tyrone Clemons. Traditionally, skateboarding has not been considered academic and is often negatively represented in conservative culture as a result of its association to punk movements. The nature of the event—a supercharged fusion between scholarly inquiry and heart-pounding visual display—allowed for the participants to be accurately represented as inventive minds by sharing their collective knowledge and experiences. As a former skateboarder, Innoskate intertwined my interests for history and skateboarding, creating new perspectives that I had never before considered! My involvement has also evoked further interest into the themes of progress and ingenuity that skateboarding embodies. As for the participants, I have never met a more compassionate, down-to-earth, and appreciative group of people. For the future, I hope that this event not only helped the public reevaluate skateboarding as a constructive endeavor, but also compels us to recognize and appreciate the creative qualities that exist everywhere, especially those beyond our conventional perceptions.